Plant in existing soil. DO NOT ADD AMENDMENTS. 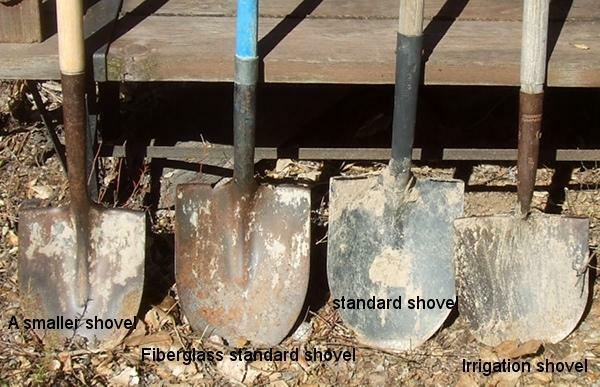 If the soil is brick hard, water the week before you plant or mulch the area a few months before with shredded redwood, shredded cedar, or use arborist chips of chaparral, pine, oak..
No newspaper, straw, green waste, lawn clippers, come on, where would you find those in nature? Really? DO NOT FERTILIZE or amend the soil. Mulch needs to be a few inches deep and appropriate for the plant. WEED! 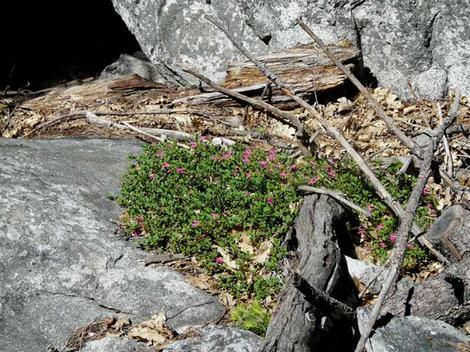 Weeds are the anti-native. WEED!!!!!! !, It's easier to get rid of them before you put the plants in. They're your enemy; remove them. (Any way you can that fits your particular situation. We have used post-emergent herbicides, shovels, tractors, and hand weeding.) DO NOT TILL or RIP the soil. Do not remove the weeds with tools unless you're going to plant or mulch. Disturbance favors weeds. Weeds favor weeds. Weed control is always the lesser of evil. Generally the weeds are more evil than the herbicides. Remove the weed debris and put it in your compost pile, trash, or whatever, but do not use it on our plants. Remove the evil nasties. May you have the curse of noticing weeds, the planet would be a better place if more folks noticed. Basic weeding. Nicer to watch than to do. Dig the holes about the size of the root ball or a little bigger. Don't dig holes smaller than the plant and rip off half the root ball or try to stuff it in the hole anyway (watch the lazy ones; they'll do this). Do not dig a huge hole for a small plant. The ground will settle; and plant will be below ground level and drown during the winter. Use your body weight to push the shovel into the soil. Use the shovel handle as a lever. It's amazing to see a landscape crew working where half the guys do not know how to use a shovel. (I like to use that as a test for gardeners.) A gallon plant is only 6 inches or so across, see if you can find a 7-8 inch shovel, dig it! Do not try to dig holes with a trenching shovel, you'll break an ankle, or the shovel. Scrape one finger along the edge of the root ball to make sure the roots are not coiled. Generally, if you have to cut the pot to get the pot out, the plant is pot bound. If you tear up the root mass the plant will likely die, and if the root ball falls away more than 20-30% the plant may die. (Many of the riparian species are exceptions.) Give the plant more water if you did a no-no. If you do not run your finger along the edge the plant will have problems later as the roots will be coiled into a gnarled mass. Disturb the root ball enough so the roots are no longer coiled, but do not tear up the root ball. This is how you should plant any plant, not just native plants. Running finger along the edge of the pot before you plant the plant. How to plant a native plant. Try not to disturb the ground more than you have to to remove the weeds and debris. If you do not have weeds or debris, just dig a hole and plant. This is how you should plant any drought tolerant or native plant. Vegetables and flowering perennials you get from an impulse buy need the fertility of soil amendments and more water. Fill around the plant with the dirt you dug out of the hole. Do not put a fertilizer tab in, as we're not planting a latrine. If there's more than one of you planting multiple plants, one digs holes and fills for the plants behind him as the other plants, stacks pots, and tamps. Use your feet as tamps. Step on both sides of the root ball to make sure it is making full soil contact. (Do this lightly if the soil is wet.) If you wish to use pre-emergent herbicides this is the point at which you apply them. Use Mulch. Either place it by hand, with wheelbarrow or tractor on top of the ground around the plant. It is important to recognize that desert and prairie plants want rock or boulder mulch, chaparral and woodland plants want tree mulch mixed with boulders(or large rocks), conifers want tree mulch. Vegetables and English Garden types hate mulch. Water the first time to fill any soil voids and to rehydrate the soil. If the soil is dry, apply as much as 30 gallons. Then water with a sprinkler for up to 24 hours. Do not directly water the crown get wet after the first year. Overhead water is ok, putting the hose down next to the plant is not. No drip(see drip section.) Usually,(always exceptions), you can water as much as you wish, as long as you do not put the hose down. Second year and succeeding years: If the plant originated from an area of higher rainfall than your area, water extra from November to March. If the plant originated from a community that receives fog drip in the summer you will also need to do some light sprinkling during the summer. If your rainfall is between 12-20 inches and coastal you should be ok, if above 20 inches in areas that regularly exceed 100 degrees you should be ok. If the year is unusually dry, supplemental water can be applied from March through May. (You got 3 inches of rainfall up into February, might be time to water.) Other than that, discontinue watering. 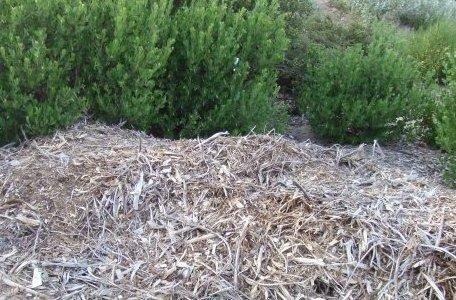 Try to maintain the mulch at a depth of two inches and wash the dust off of the foliage once a week or so. If you want to be 'fire safe'(ha!) and have a lush native garden, wash the foliage off once a week with hose(no setting the hose down) or sprinkler irrigated 5 minutes or so, maybe 10 minutes in Palmdale. How to water after planting. Irrigating the plants after planting requires a lot at first and then little or none after the first season. Watering after planting varies by season and location. If you just got a lot of rain and it's winter, no extra water is probably required. If you're planting in Jamul or Barstow in September, water for hours, several times. When in doubt, Mulch! Native plants usually like it. If you have kids, make sure they help. They get better as they practice. Some of the plants she planted actually lived!